As you’re closing the doors and reflect on the past year’s events, think about what the future will hold for corporate America. Big changes are to come with the close of one year and the welcoming of another. And businesses are going to be the subject of these major changes a few years down the road. How big of an effect these changes may have is up for debate. Call it optimism, call it realism, call it whatever you’d like, but businesses will never be as straightforward as it once was. Cue in the Millennial workforce, new tech, and modernized expectation of industry workplace standards. So what makes Millennials particularly important in the future? Suffice to say, the Millennials are going to take up a large chunk of the workforce in the next coming years. One third to be exact. With their arsenal of tech skills and can-do mentality, it’s no surprise they’re predicted to become key players at the big kid’s table. Are Millennials really that much different than other generations though? There are enough blogs out there that will tell you everything from their work ethic all the way down to how they like their toast. But think back to all those studies and articles you’ve come across in the past couple of years. They all have one thing in common: they’re pinning Millennials as ‘different.’ According to Bruce N. Pfau, their differences are an attribute of being young rather than being part of their generation. Go back a decade or two and you’ll see that the industry was treating Gen X the same way as we treat Millennials today. And because Millennials are now entering the workforce, they’re going to bring with them the values and expectations seen in young people. As with any wave of young people entering the workforce, Their priorities remain similar for the most part. Job security is one thing they place a heavy emphasis on. They’ve seen how their relations struggled through recessions in the ’70s up to the ’90s. With this in mind, it’s no wonder they place heavy emphasis on a job that they feel secure in. Their work ethic is through the roof with 73% of Millennials working more than 40 hours a week. The technological advancement of the 21st century has come a long way since the dot-com bubble of 2000. Advancement may be a bit of an understatement. We’ll say technological invasion, it has a better ring to it. More of today’s tech have a strong focus towards a similar intent: to make humans’ lives simpler. Be it manager, CEO, or common office employees. When we say tech we don’t always mean the physical kind. Though individual temperature systems and robotics will be making an appearance come 5 years from now. And the corporate industry is propelling itself into a state of reliance upon such benefits. Can you imagine a world without the use of data, without video conferencing or cloud storage? Let’s place this unfathomable only-in-a-zombie-apocalypse scenario to the back burner, and focus on what’s yet to come after the end of the year. – Elevator problems are going to be an issue of the past. Yes, say hello to the smart elevator. Coming to a corporate building near you! – Still wearing your sweater indoors? We think you’re going to like what Under Armour, Cisco and Johnson Controls are cooking up with their Comfy app. An app designed with employees in mind, it’s geared towards creating a workspace that is not just tolerable, but comfy. – We can’t forget about the non-tangible tech, can we? SaaS and consumer data usage will continue to improve consumers and employees lives’ alike. Think realistically for a sec. What’s the percentage of people who answer a survey or give their opinions honestly? Consumer data CANNOT LIE which will continue to make it invaluable for business. According to experts, only 1% of our data is being used effectively. The predicted change (fingers crossed) will be that we use our data more adequately than we do now. As for cloud-based services, we have them to thank for eliminating the need for an IT department. Or if your company still has an IT department, expect to see more consumption-based IT services. Expect to see talk of ‘connected clouds’ or ‘multi-cloud’ options. The need for networking, security, and cloud services overall will prompt this need for a seamless yet secured mix of workloads. What do you think of when you consider job flexibility? According to WERK, a flexible job is a full-time W2 role with a structured set of time or location-based modifications. Something entirely separate from the gig economy which is what some of you may be thinking when we say flexibility. In this kind of position, a person can rearrange their workday hours and decide what their schedule will look like for the day. If they want to beat the dreaded rush hour traffic, they can schedule their day to start early and leave early. They can also section their day to accommodate peak performance times or lagging periods. With the ability to create a condensed work week, can someone say 3 day weekend? The deal with micro-agility is that employees have the freedom to handle unexpected situations in smaller time increments. So if you get a call asking to pick up your kid earlier than usual, you have the ability to do so. You’re allowed to leave and come back no problem. Employees will typically work out of their office within the company. But if they’re allowed to work from a designated location for a period of time, this is a DeskPlus kind of job. If there comes a day when you’d rather not hassle with the 2-hour commute, this option is optimal. Especially for reducing the stress that can go with tiring commutes. Working in a different space than the office can prevent boredom from a typical office space and can increase creativity as well. Everyone should acquaint themselves with this type of job position at some point in their lives. This allows for the ultimate level of freedom since you can work your 9 to 5 job without ever leaving the comfort of your own couch. Aside from the occasional in-person meeting, this job position is entirely self-dependent. This position allows for minimal to no travel at any given time during the year. So if you are a person that loathes business trips, this is the job for you. Video meetings and online technology will be very helpful in this case to stay in touch. So while part-time is not exactly considered a full-time position, it’s still a form of employment. You’re able to optimize your skills towards your job with a reduced amount of hours. And the reduced workload allows more time for other activities. It’s reported that the US workforce is not receiving the necessary amount of flexibility that they would like. Thus, it’s having an effect on their performance and well being. A company can gain a competitive advantage from offering an adaptable workspace and improving the way employees work. Whether it’s the liberty to step away from the desk or to have the choice of having no desk, job flexibility is a new trend that will do more good than you’d expect. Well, folks, nothing will ever be the same as it is now. In other words, nothing holds more potential than the years we have ahead of us. From the people you work with, all the way down to the software on your computer, the workplace is a space where great development is inevitable. And as more people envision what they want out of their lives, the less they’re settling for outdated standards and habits. The advancement of tech and the optimization of a work-life balance has prompted employees to think outside the box. A box that just keeps getting smaller and smaller the further away we steer from it. What was new yesterday is old today. What is new today will be old tomorrow. 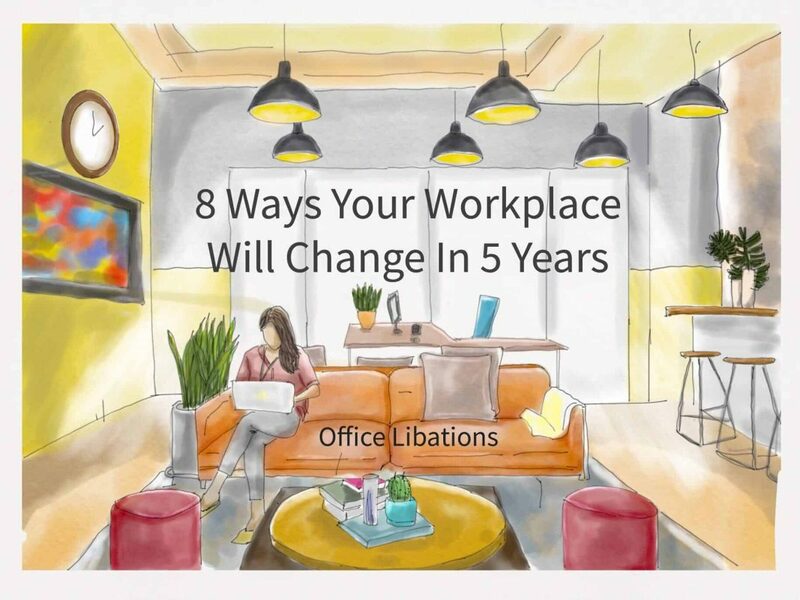 The workplace is due for an update. All we can do is take the ball and roll with it.